One of the largest cut diamonds in the world, and the centre of the British crown jewels, the Koh-i-Noor is one of the most mythologised jewels in the world. 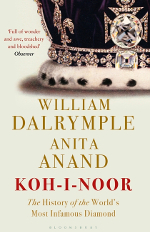 In Koh-i-Noor, William Dalrymple presents the definitive history of the ‘Mountain of Light’, from the various claims made on it today, to the controversies and plunderings of its past, all in vigorous and erudite prose. Dalrymple has received multiple awards for his works of Indian history, and is a magnificent speaker. We are delighted to welcome him to St Andrews.